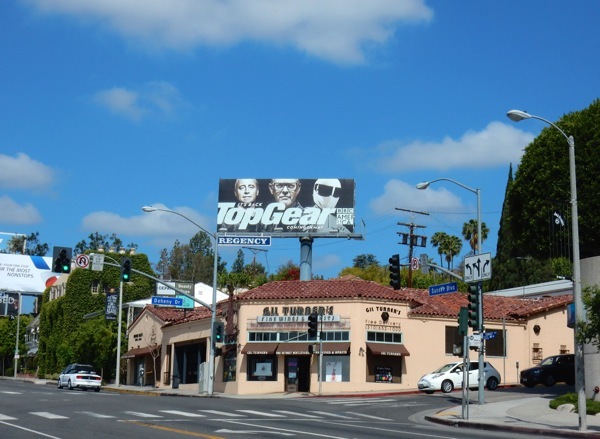 For the twenty-third season of BBC's popular car and motoring show, Top Gear, there's a whole new set of hands at the wheel. 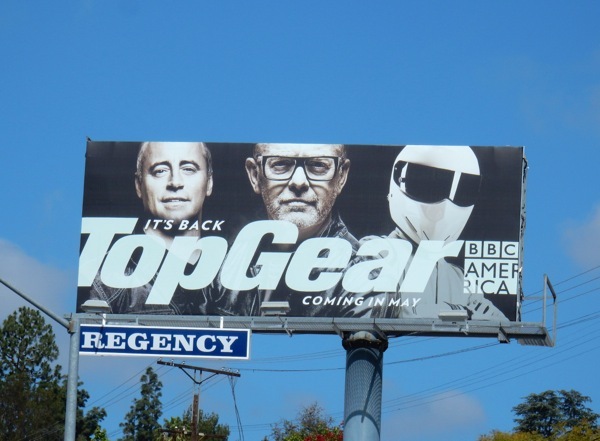 Following the very public firing of former host Jeremy Clarkson after childishly punching the show's producer (and the subsequent exit of his co-presenters Richard Hammond and James May), it's up to new presenters Matt LeBlanc and Chris Evans (sadly not of the 'Captain America' variety) to put the iconic series back on track. The former Friends sitcom star and the TV and radio presenter will of course be joined by test driver 'The Stig', plus other auto enthusiasts including racing driver Sabine Schmitz, YouTube personality Chris Harris, motoring journalist Rory Reid and Formula One expert Eddie Jordan. 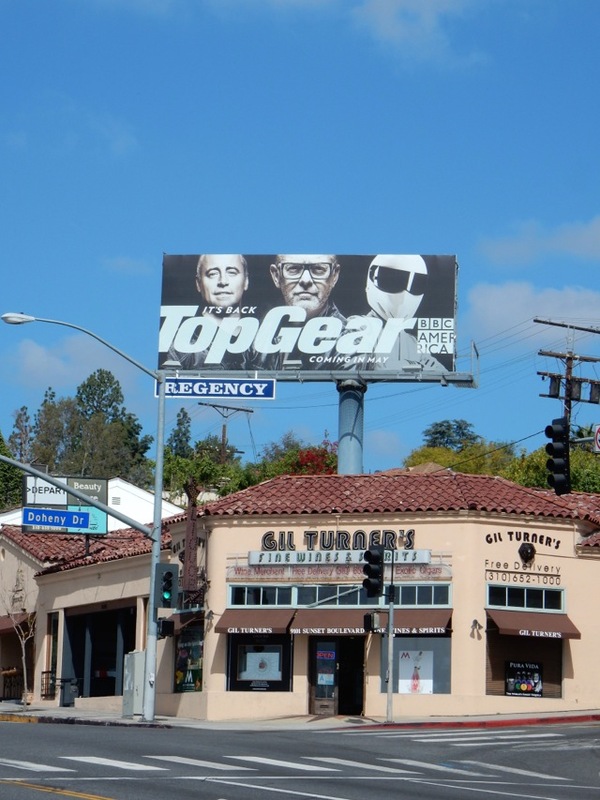 This billboard for the show's new lineup was snapped along the Sunset Strip in West Hollywood on May 1, 2016. 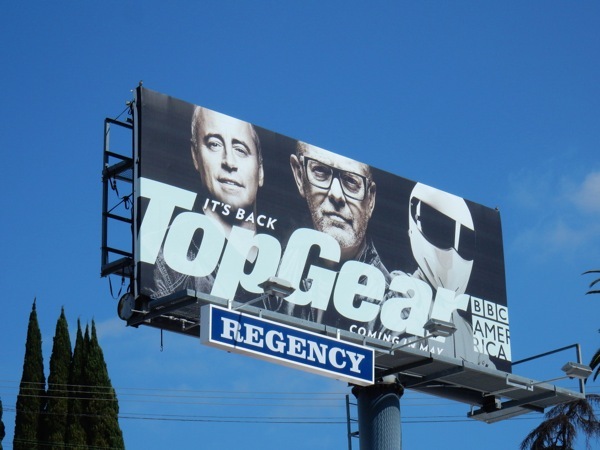 If you're a fan of the show, be sure to also check out this BBC America Top Gear billboard with the original trio from 2010 and History's U.S. Top Gear remake billboards from 2010 and 2011. Only time will tell if the new team can get up to speed and recapture the heart of Top Gear's avid fans around the world. And don't worry about the former presenters, they've landed a lucrative deal (a rumored £160 million) at Amazon to launch a brand new show where they get to drive all the fast cars they want to their heart's desire.